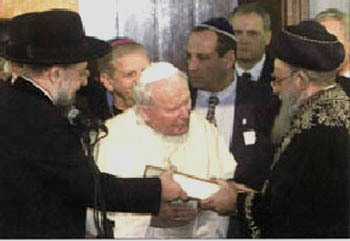 JOHN PAUL II “BLESSED” BY THE RABBIS - On January 18, John Paul II received about 160 rabbis from around the world at the Vatican. They went there to celebrate the change that Vatican II made in Catholic teaching regarding Judaism, and to pay official homage to this Pope for his support of Jews and Judaism. At the climax of the meeting, three rabbis carried out a religious ritual to “bless” the Pontiff. The information I transcribe regarding this encounter is from news reports by CatolicaNet (January 18, 2005, online) and the National Catholic Reporter (January 20, 2005, “Word from Rome,” online). Appraising the meaning of the meeting, rabbi Jack Bemporad, director of the Center for Inter-Religious Understanding (CIU), declared, “For the first time in History, rabbis from all branches of Judaism met in Rome to thank a Pontiff.” Among the important rabbis present were the president of the college of rabbis of New York, the ex-chief rabbi of Europe and France, the chief rabbi of Jerusalem, and the chief rabbi of Rome. Recalling some of the ground-breaking landmarks, he pointed out that John Paul II was the first Pope in History to visit a synagogue; this Pontiff also established diplomatic relations with Israel, and asked forgiveness for the combat the Church has always made against Judaism (CatolicNet). This was the largest papal audience ever with a group of Jews. Normally when the World Jewish Congress or the Anti-Defamation League visits John Paul II, the delegation is composed of no more than 15 to 20 persons. Rabbi Joseph Ehrenkranz from Connecticut said that while some Catholics	"don't know" about the revolution that happened since Vatican II, many Jews "don't believe it." In that light, Ehrenkranz said, the January 18 audience was an opportunity for Jewish leaders to publicly acknowledge that the transformation is real. Rabbi Gary Krupp, who initiated the plan to bring 160 rabbis to the Vatican, praised John Paul II in a solemn speech: "You have defended the Jewish people at every opportunity, as a priest in Poland and in your pontificate." He recalled John Paul's 1986 visit to the Roman synagogue, the first by a Pope since the time of the early church, and his 2000 trip to Israel. Enigmatically, Krupp also added that John Paul II embodies the "spirit of Aaron, the high priest of ancient Israel." After he finished his speech, three rabbis blessed John Paul in Hebrew and English. One part of the ceremony was open to the press, another was closed. No reports about the latter (National Catholic Reporter). Why were these rabbis given such a spectacular gathering at the Vatican? 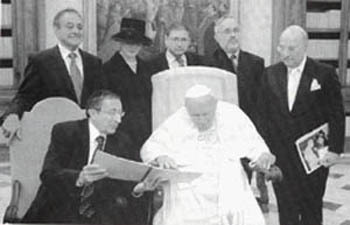 The official explanation was that the event celebrated the 40th anniversary of the approval of the conciliar declaration Nostra aetate, which took a progressivist approach regarding Jews and Muslims. I don’t believe that this is the real reason. First, because the 40th anniversary of Nostra aetate will occur only on October 24, 2005, too distant a date to generate a special festivity in January. Second, because the week of January 16-22, when this audience was granted, has been dedicated to Catholic-Jewish relations. It seems to me the real reason lies in the background of this fact. Let me explain. On January 20, 1842, Alphonse Ratisbonne, a young French Jew from an important banking family in Strasbourg and close relation to the Rothschilds, witnessed an apparition of Our Lady and immediately converted from Judaism to the Catholic Church. His conversion, which took place in Rome, represented a spectacular victory of Our Lady over Judaism that had enormous repercussions in Italy, France, and the whole Catholic world. The devotion of Our Lady of the Miracle was born on that occasion and the Basilica of Sant’Andrea delle Fratte, where the miracle took place, became a center of special prayer for the conversion of the Jews (for the whole story, click here). Alphonse Ratisbonne and his brother, Theodore, who had converted also, became priests and founded a new religious institution – the Congregation of Our Lady of Sion – dedicated to the conversion of Jews from their perfidious religion to the Catholic Church. Fifty years later, on January 17, 1892, the Vatican Capitolo granted the special honor for the picture of Madonna del Miracolo (Our Lady of the Miracle), which was crowned as Queen. This Vatican act was an endorsement of a growing popular devotion to Our Lady of the Miracle, an indirect approval of the commemoration of the conversion of Alphonse Ratisbonne, and a blessing of the general aspiration for the conversion of the Jews. Since that time, every year the week including the two dates of January 17 and 20 was dedicated to celebrate these events. As should be expected, after Vatican II, the progressivist Holy Sees of Paul VI and John Paul II froze those festivities. But not only this. When I visited Rome in January 1993, I saw that the week had been re-directed to commemorate the precise opposite. That is to say, there was no more mention of the conversion of the Jews, and everything was designed to celebrate Catholic-Jewish inter-confessional dialogue. Throughout Rome, ecumenical events were scheduled with this aim. These inter-confessional commemorations have continued up to the present time. Therefore, the January 18 audience granted to the large assembly of rabbis made up part of the week of Catholic-Jewish dialogue of 2005. I wonder if in this last January event, we didn’t take another step on the road of destruction of the traditional Catholic position. That is, it was an opportunity for the Jews to state openly and officially that Judaism is the “true” religion, without any need for conversion to the Catholic Church. Judaism would be so “true” that 160 rabbis came to Rome to proclaim this and “bless” the Head of the Catholic Church with their sinister rituals. In practical terms, the rabbis would have gone to the Vatican to revenge the conversion of Ratisbonne, to deny that he needed any such thing, and to present the apparition of Our Lady of the Miracle as irrelevant and foolish. The whole episode represented, in my opinion, a great symbolic outrage to Holy Mother Church propitiated by the present day Pope. The conversion of Ratisbonne took place 163 years ago. Was the number of rabbis who visited the Vatican – around 160 – meant to match the number of years that have passed since it occurred? I don’t have data to make any serious conclusion about that.